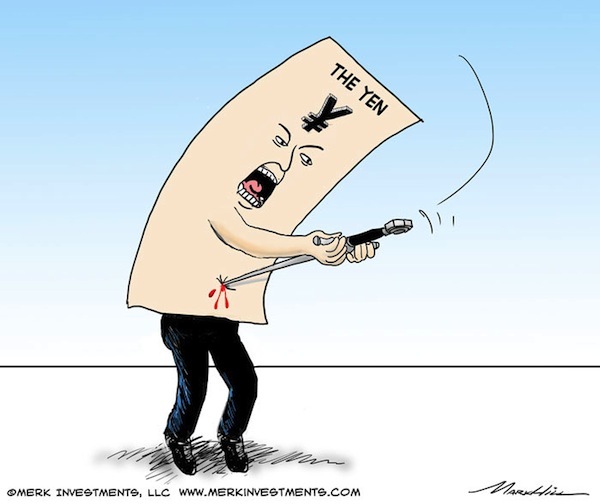 Merk Insights - How Low Will the Yen Go: Depression-Era Policies? When we asked last November whether the yen is doomed, it was before current Prime Minister Shinzo Abe was elected. We have since answered the question in the affirmative. But to understand why we believe the yen might be worthless one day, we look at Japan’s challenges from different angles. Today, we focus on Japan’s stated goal to pursue Depression-Era policies. Today Japanese government debt has swelled to over 210% of GDP; prolonged deflation would only make it increasingly more expensive to pay the interest. Japan's debt-to-GDP ratio rose to 200% in 1945, as a result of the massive war debt accumulated during World War II. At the time, a combination of hyperinflation and default helped Japan drastically dilute its debt, as exemplified by the sharp decline of debt-to-GDP ratio from 200% to 56% by 1946. It shall be noted that in the post-War debt restructuring most lost more than just the purchasing power of the yen: among other measures, in 1946, there was an exchange of old yen banknotes to new banknotes, with individuals limited to receiving 100 new yen. Similarly, there was a scheme to freeze bank deposits, with withdrawals allowed only to pay for living expenses. 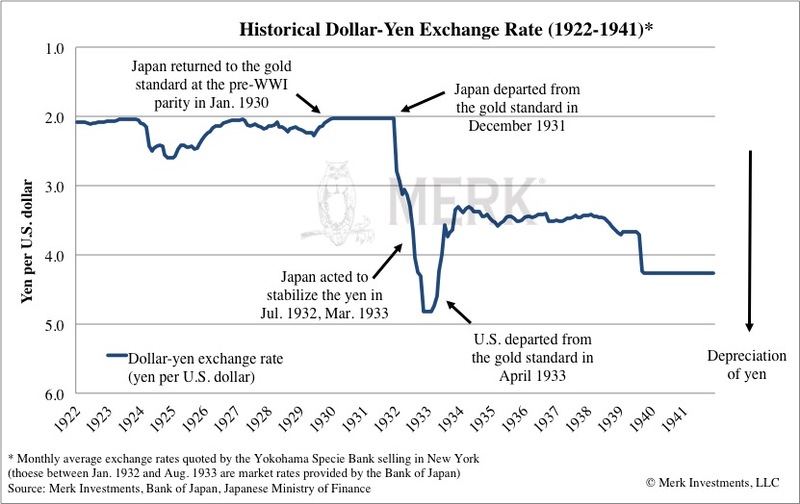 In 1949, as part of the Bretton Woods accord, the yen was fixed at 360 yen per dollar. That exchange rate was reset in 1971 to 308 yen per dollar before floating exchange rates were introduced in 1973. Yes, that’s the same scale as above where between 2 and 5 yen bought a dollar; and it’s the same yen that’s currently valued at a little over 90 yen per dollar. The fewer yen necessary to buy a dollar, the stronger the yen. If Japan's public debt stays on its current trajectory, it may provide a strong and continuing incentive for the Japanese government to further weaken the yen, to curb, and perhaps reverse, the rise of real debt service cost in a deflationary cycle. We compared the magnitude of the 1930s’ yen devaluation to the recent depreciation of the yen, with major events in the 1930s highlighted. Also shown in the chart is the weakening of the yen in the late 1990s, the longest period of continued depreciation after the 1985 Plaza Accord. The yen depreciated around 40% during the period, largely due to the U.S. "strong dollar" policy announced by then Treasury Secretary Robert Rubin in 1995, as well as the Asian financial crisis during 1997-1998. 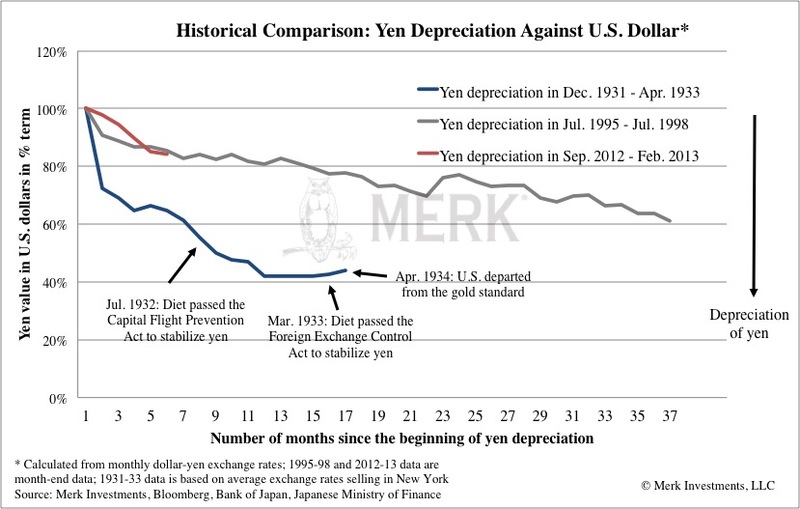 As depicted in the chart, compared to the two historical cases, the magnitude of recent yen depreciation remains contained. While past performance is no guarantee of future results, we do see parallels between the current environment and that of the early 1930s in Japan, especially in the weak post-crisis recovery, the rise of militarism, global racing to the currency bottom, as well as an administration with an aggressive stand on fiscal, monetary, and exchange rate policies. Back in the 1930s, then Finance Minister Takahashi was assassinated soon after he started to reduce government spending – notably military spending -, and his successors gave the army a free hand in budget spending; this time, outgoing BOJ Governor Shirakawa stepped down early, with the Bank of Japan embracing a new era of unlimited easing. While Japan is far from engaging in a dramatic military spending spree, Prime Minister Abe has suggested he would ramp up military spending, introduced a more nationalist tone in recent speeches, even openly contemplated changing Japan’s pacifist constitution. Yuan Fang is a Financial Analyst at Merk Investments and member of the portfolio management group.